Hunting Badger manuscript being processed. This is the Reader's Digest Seleções de Livros Portuguese edition of Hunting Badger. Published in 2002 by Reader's Digest Brasil Ltda. Translated into Portuguese by Lilian Dias. The volume includes novels by Nicholas Sparks, Robert Crais, and Judith Henry Wall as well as Tony Hillerman. This hardcover volume has a dust cover. 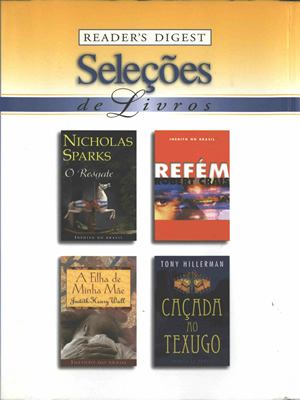 The front cover reads "Reader's Digest" and "Seleções de Livros" at the top, and displays four thumbnails, one for each of the included novels. The back cover displays photographs of the authors accompanied by press quotes. The front flap contains synopses for three of the included novels. The back flap contains the fourth synopsis and an announcement of an upcoming volume containing a John Grisham novel. There is also a tear-off blue bookmark displaying a quote from Napoleon Bonaparte. The inside front and inside back covers are blank. The endpapers are cream. Binding: Blue vinyl-covered boards. The included novel titles are printed on the spine in silver.